On Thursday night, Mieszko Fortunski watched as a late lead evaporated against Jayson Shaw, with the reigning Turning Stone Classic Champion using a late rally to defeat the Pole, 11-9. One night later there would be no such late match drama, as Fortunski capitalized on a handful of unforced errors and breaking struggles from Jesus Atencio to easily handle the Venezuelan, 11-3. 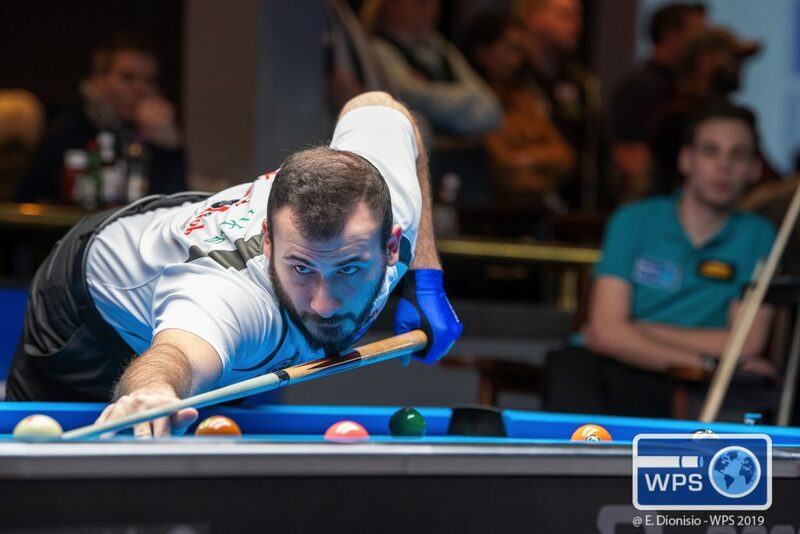 The victory clinched a spot for the Pole in Saturday’s single-elimination final 16 brackets of the Predator Grand Final at Astoria’s Steinway Billiards. Fortunski will face Filipino Dennis Orcullo at 2 PM, one of eight matches to take place tomorrow morning and afternoon with a slot in the quarterfinals on the line. The action gets underway with four matches Saturday morning at 11 AM Eastern time, including Klenti Kaci taking on Darren Appleton on the live streaming table. Other morning matches include James Aranas taking on Petri Makkonen, Mika Immonen facing Mike Dechaine and Jayson Shaw matching up against Ralf Souquet. Familiar foes will face each other on the streaming table during the afternoon matches when Joshua Filler re-matches with Alex Kazakis. The two, who locked horns in the semifinals of the WPA World 9-Ball Championships last month, staged one of the more dramatic matches of the day Friday. It appeared that Kazakis might win the set handily during the early stages of the match as he jumped out to an early 4-1 advantage then increased his lead to 8-3 as Filler struggled with position play and some unfortunate rolls. The young German slowly chipped away at his deficit, narrowing the score to 9-6 as Kazakis began struggling with cue ball control. Filler slashed the advantage to two games when Kazakis misplayed position on the 7 ball. As the match became closer, Kazakis’s pace of play slowed significantly as he pondered and studied each shot intently. 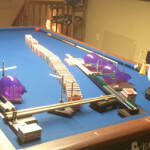 He increased his lead back to three games after using a safety battle to slowly and methodically run out the 17th rack. The Greek appeared positioned to close out the match in the 18th game but missed a sharp cut shot on the 9 ball, again allowing Filler to climb to within two games. The lead was cut to a single game when Kazakis committed a foul kicking at the 1 ball in the following rack. Again, Kazakis battled not only his opponent but his nerves during the tension-filled set. In the 20th game, the ball both players were focused on was the 4 ball, as another safety exchange ensued shortly after the break. 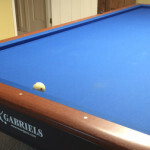 With the ball tucked near the 7 ball and the corner pocket, the Greek used a nifty carom shot off of the 7 to cut the object ball into the pocket, then watched as the cue ball traveled three rails for position on the 5 ball to finish the rack and the match. Filler moved to the one-loss side of the bracket, where he jumped out to an early lead against John Morra and easily defeated the Canadian, 11-4 to secure a position for Saturday. Morra had been flirting with disaster throughout most of Friday. He spotted Hunter Lombardo an early 5-2 lead in his first match of the day – eventually pulling out an 11-8 victory – then needed to gut out a sudden death shootout to defeat Poland’s Konrad Juszczyszyn. Finland’s Makkonen advanced to Saturday in a nip-and-tuck match against Thorsten Hohmann of Germany which concluded with a sudden death shootout. The two trading pocketed shots through the first four innings but Makkonen took the match when he sunk his shot in the fifth inning while Hohmann followed by pushing the object ball into the side rail. Souquet, who began competition with an opening round loss to Dechaine, earned a spot in the final 16 with three straight victories on Friday – defeating Michael Leahy 11-0, Omar Alshaheen 11-6, and Denis Grabe 11-6. Appleton recovered from an 11-4 loss on the winner’s side to Aranas with a convincing 11-5 victory against upstart American Tommy Tokoph, earning an entry into weekend play. Dechaine reached the tournament’s third day by posting a convincing 11-2 victory against Gary O’Callaghan and Tony Robles advanced by defeating American Matt Krah, 11-8. The other afternoon matches include Ruslan Chinahov going up against Robles and Chris Melling playing Zion Zvi, who needed to come from behind to beat European teen star Kristina Tkach, 11-9. Things weren’t looking so good for Jayson Shaw. 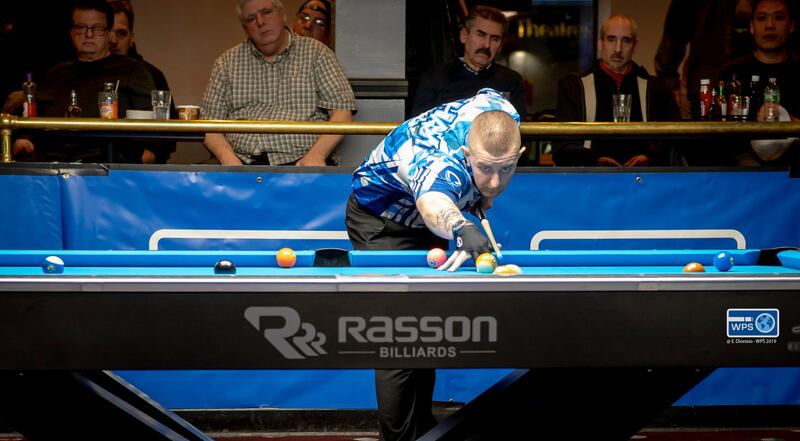 The talented, young Scotsman trailed Poland’s Mieszko Fortunski nine games to eight in his opening round match of the Predator Grand Final and had just missed a bank shot on the 1 ball. 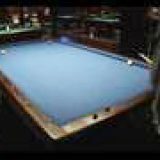 With just two games needed to win the race-to-11 set Fortunski’s fortunes changed, as Shaw took advantage of a pair of last-minute opportunities to pull ahead and gut out the back-and-forth match 11-9 at Astoria’s Steinway Billiards. Neither player held more than a two-game lead throughout the two-hour match, as they not only traded leads but also some uncharacteristic errors along the way. Shaw jumped out to an early 4-2 lead but Fortunski used a break-and-run and a missed 1 ball by his opponent to tie the game. The Scot pulled ahead 5-4 but failed to pocket a ball on the break and watched as the Pole won back-to-back games to regain the lead, 6-5. And so it went throughout the remainder of the match, with one player taking climbing ahead only to see their opponent storm back to either tie the match or reclaim the lead. Shaw fell behind 9-8 after he misplayed a safety in the 16th game that led to a run out by Fortunski, who then broke and ran in the following game. When he missed that 1 ball bank shot into the side pocket in the 18th game it appeared Shaw could be heading to the one-loss side in the first day of competition. However, the European Mosconi Cup team member gained new life moments later when Fortunski scratched. The Scotsman cleared the table to tie the match at nine games each the took a 10-9 lead when his opponent failed to pocket a ball on the break in the next game. After Shaw pocketed a ball on the break in the 20th game he used a well-played safety on the 1 ball to maintain control of the table and the rack to win the decisive game. The match was one of many nail-biters on the first day of competition in this final World Pool Series event of the season – with Tony Robles and Darren Appleton winning first-round matches on the winner’s side in sudden death shootouts. Robles defeated Canada’s John Morra and Appleton defeated Filipino Carlo Biado in eight frames in which both players struggled to put away their opponent. Biado, who was a runner-up at the World 9-Ball Championship in Qatar last month, started his day by fending off a comeback attempt by Omar Alshaheen and defeating the Kuwaiti, 11-9. After trading games during the first half of the match, Biado capitalized on a handful of mistakes by Alshaheen to take a 9-5 lead. The Kuwaiti used a break-and-run and a couple of Biado errors to cut the lead to 10-8. Standing at the table with the break, Alshaheen had the chance to pull within one but scratched – handing Biado ball-in-hand and the match. The action resumes Friday at 11 AM Eastern time with 10 second-round matches on the one-loss side, including American Michael Leahy facing Ralf Souquet on the stream table. The 1:30 PM match on the broadcast table will be Morra versus the winner of a morning match between Americans Hunter Lombardo and Keith Guenzel. The winner’s side of the bracket begins to heat up at 4 PM with Appleton facing Filipino James Aranas, Denis Grabe of Estonia taking on Mika Immonen and Greece’s Alex Kazakis scheduled to meet Joshua Filler on the video streaming table in a rematch of the last month’s World 9-Ball semifinals. The broadcasting schedule for the 6:30 PM and 9 PM matches will be determined later. Fans looking to watch the action can purchase a pay-per-view online streaming package – with one-day viewing passes costing $8.95 and full tournament access costing $24.95.